Ideal terroir and top winemakers produce world-class wines in the Gem State. 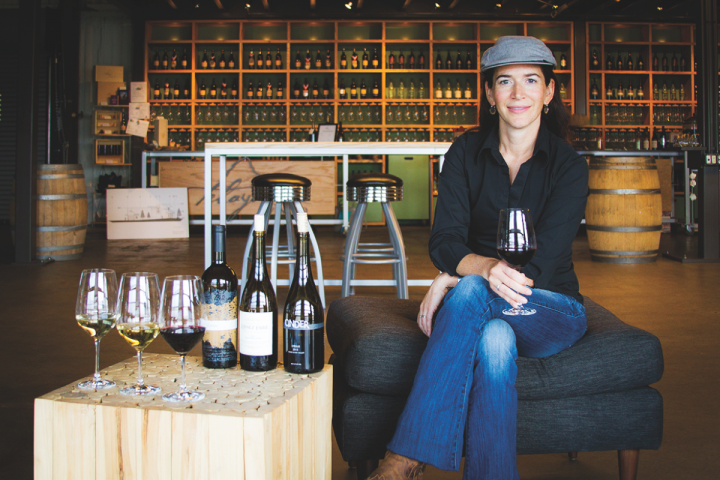 Melanie Krause cofounded Cinder winery in Garden City with her husband, Joe Schnerr. The company benefits from proximity to Oregon and Washington, where consumers have adventurous palates. Wine industry folks in Idaho don’t take themselves too seriously. The Idaho Wine Commission website features a satirical video, titled “Idaho … More Than Just Wine.” Yet Idaho wineries, which produce more than 200,000 cases a year, make serious wines. At Planet Wine in Alexandria, Virginia, manager and wine buyer Joe Kulp stocks the 2012 Sawtooth Riesling ($15 a 750-ml. bottle) and 2012 Sawtooth Merlot ($18). “We offer interesting wines not found anywhere else, and Sawtooth fits the bill,” he says. “The wines are at a great price point, so customers are willing to experiment.” Planet Wine featured the brand’s Riesling during the store’s “Summer of Riesling” promotion, and Kulp may bring back the Sawtooth Syrah (the 2012 vintage retails for $16 on the brand’s website), which sold well in the past and was featured at this year’s Vinexpo in Bordeaux. Chardonnay and Cabernet Sauvignon are Idaho’s top varietals, yet the terroir—often compared to that of Spain’s Rioja region—is also suited for Riesling, Syrah and Tempranillo. “Idaho is a high mountain desert with a semi-arid climate, distinct temperature shifts, and well-drained soils that include volcanic beds and lake bottom sediments,” says Moya Shatz Dolsby, executive director of the Idaho Wine Commission. During the summer, grapes get 16 hours of daily sunshine, and winegrowers can control watershed from the Rockies. The federal government is reviewing two more potential AVAs in the state. National retailers like Albertson’s, Whole Foods, Walmart and Costco now feature Idaho wine sections at some stores and participate in the Idaho Wine Commission’s month-long promotion in June. Reaching the larger public is the greatest challenge, says Joe Schnerr, co-owner of the Cinder winery in Garden City. “It helps that we share a border with Oregon and Washington, where there are adventurous consumers,” he explains. “We consider ourselves part of the Northwest wine scene.” Cinder wines are distributed in several western states, and Schnerr—who runs the operation with his wife, winemaker Melanie Krause—plans to boost production to 10,000 cases within the next four years. Idaho wines are gaining traction at local on-premise venues. Kacey Montgomery, owner of the Boise restaurant Juniper, offers 17 Idaho wines and pours 14 by the glass. Top-sellers include the 2013 Coiled Dry Riesling ($7 a 6-ounce pour; $34 a 750-ml. bottle), the 2012 Telaya Olta Red ($9; $38) and the 2011 Split Rail Petit Verdot ($58 a 750-ml. bottle). “Idaho’s winemakers are young and approachable, so we bring them in to introduce their offerings,” Montgomery says. A block away at Fork restaurant, owner Cameron Lumsden serves 10 Idaho wines and pours all of them by the glass. Best-sellers include the 2014 Cinder Dry Viognier ($9.50 a 6-ounce pour; $38 a 750-ml. bottle) and the 2013 Coiled Sidewinder Syrah ($10; $40). “We sell as much Idaho wine as we do Washington wine,” Lumsden says.